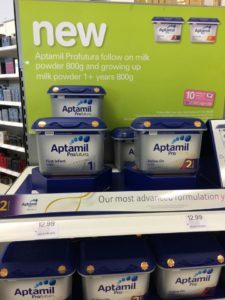 Baby Milk Action is receiving many more reports of retailers in the UK promoting infant formula in breach of formula marketing regulations as Nestlé and Danone step up their competition. This comes as a survey reveals budgets for Trading Standards services in England and Wales have been slashed by over 40% since 2009 (from £213 m to £124 m). Trading Standards officers are responsible for enforcing the Infant Formula and Formula Regulations (2007) in England and Wales, but according to the Chartered Trading Standards Institute, staffing levels have fallen by approximately 53% since 2009. See Total GB trading standards spend falls to £1.99 per person, per year. “Trading Standards officers cover a lot of areas in protecting consumers from unscrupulous companies and need the resources to do so properly. Most mothers in the UK say they wanted to breastfeed for longer and stopping misinformation and aggressive marketing from formula companies is one of the measures required. We recommend people report breaches of formula marketing regulations to the authorities, but it sounds like they are overwhelmed. Baby Milk Action asks people to become a member for as little as £1.00 per month to help fund its campaigns. Marketing has become more aggressive since Nestlé, the world’s largest formula company, entered the UK with the takeover of the SMA brand in 2012. Nestlé has recruited a network of clinical representatives to target health workers, with the stated purpose of securing endorsements for the brand. 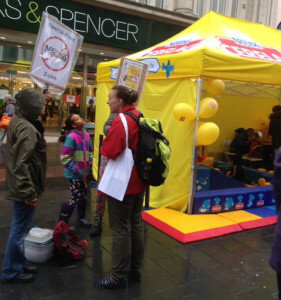 It has stepped up direct targeting of parents, for example with street stalls promoting the SMA brand (left, Baby Milk Action supporters distributed leaflets alongside a Nestlé stall in Leicester highlighting misleading claims made in its promotional materials). It is also using new methods, such as recruiting bloggers and and a TV celebrity to promote its SMA PRO formula. Danone, the world’s second largest formula company, is engaged in a fierce marketing war with Nestlé around the world. Danone rebranded its Aptamil brand as APTAMIL PRO to compete with Nestlé. It used special displays in Boots to promote the range. It is illegal to promote infant formula in this way. Baby Milk Action successfully opposed moves to decriminalise formula regulations in new Statutory Instruments, that came into force on 20 July 2016. It also presented evidence of marketing practices to the UN Committee on the Rights of the Child and UN Committee on Social, Economic and Cultural Rights this year, prompting both to call in June for the UK Government to better regulate the formula industry. The Lancet Breastfeeding Series reported in January 2016 that the UK has the worst breastfeeding rates in the world at 12 months of age (<0.5%). See our presentation to MPs for further information: Mothers need support not pressure. Members of the public are invited to send reports of violations to Baby Milk Action by messages to its Facebook page or email monitoring@babymilkaction.org. Membership of Baby Milk Action starts at £1.00 per month. Donations can also be made towards Baby Milk Action’s work holding corporations accountable.